The new Cultural Centre designed by 3RW arkitekter will provide a state-of-the-art multiform cultural centre for USF Verftet, a cultural venue housed in a former sardine factory. Located in Nordnes, a central coastal neighbourhood in Bergen, the project reimagines the site, adjacent to the current venue, as a new public space with a unique relationship with the surrounding fjord water and a building fitted for large-scale theatrical productions. The project aims at strengthening the cultural actors of Bergen at a time when the city’s artistic sector is thriving, consolidating USF as major actor of cultural production within this, provide a new public space with significant volume and flexibility for its programme, and improve circulation and access in this part of town. USF, a cultural institution in a former sardine factory with major concert and exhibition spaces, rehearsal rooms, co-working spaces and a cafe and bar, has helped transform Nordnes into a highly desirable district within Bergen. While its heritage as a fisherman town with dense streets and white houses facing the sun is challenged by the growth of the city, USF has become the main actor that has positively transformed this community and given it a unique destination. With the growth of the city and the challenge to remain attractive, it is crucial for Nordnes to strengthen and secure the new cultural centre, as it will bring a new cultural and artistic production and exhibition space. Equally important is for USF to maintain, manage and enhance the outdoor and indoor public areas offering the institution to the city. Kultur Vest AS is an organization of different cultural and entertainement institutions in Bergen working together with USF Verftet with the objective to establish a new Musical Theater to strength the cultural axis of the city. 3RW has been engaged since march 2013 to prepare a feasibility study on the adjacent site for a multiform cultural venue with a 1,300-seat stage, black-box and numerous additional spaces (foyer, restaurant / cafe, rehearsal rooms, workshops, administration and storage). Part of the idea was to exploit USF’s existing infrastructure for large-scale theatrical productions. 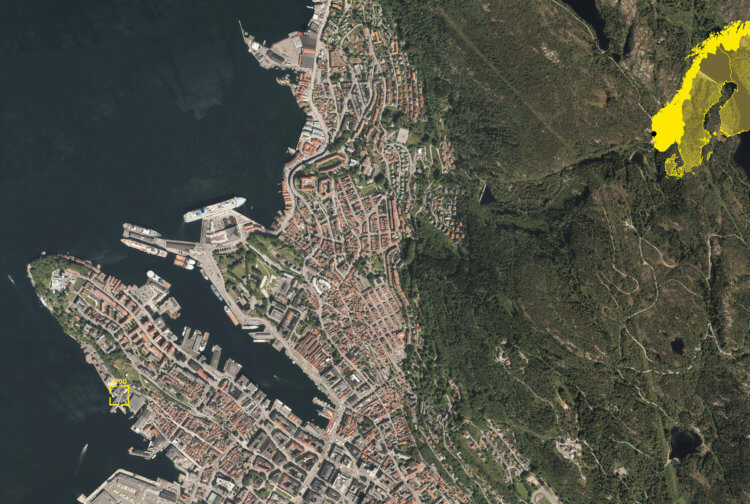 The second challenge is to ensure a transition from the old factory to the new building along the fjord. To plan the next step for one important actor of Nordnes, it is crucial to understand its mechanism. USF has sustained and strengthened in time the informal pattern of how the creative industry works. It is a very rare successful case because often promoting artistic production results in static institutionalized display of art forms, where iconicity and branding takes precedent over the actual need for artists to have an affordable place of work within the city centre with possible displays of their production. It is as if USF represents one unique example of an organization that has positively digested the gentrification process. It is a process that most often sees artists chased out of post-industrial areas to make way to glossy heartless food venues. Welcoming the extension of USF on the neighboring site would be to recognize this success and harness the subtle balance between making and showing that is the success of this lively place. One of the main focus consists in delivering a large open area on ground floor level and open Dikkedokken to the city and water. This is achieved by moving the building as close as possible to the existing USF volumes and proposing a public program on ground floor, two actions that extend the public realm deep into the building. With an informal concert area, an open and bright entrance under the stage, a café and various shared workspaces on ground floor, nearly half the plot size is given back to Bergen and its inhabitants. The proposed project – while ambitious – is shrunk to the most optimal envelope, by trimming the architecture from all superfluous shapes, and by locating secondary programmes like backstage and workshops under its volume and toward USF. Its highest point (the tower) is moved as far as possible toward USF, to allow the preservation of good views from Nordnes. The project is thought as multi-form theater, allowing not only a wide variety of show ranging from opera, chamber music, concert and theater, but also offering the possibility of shows happening on two stages simultaneously. This versatility is a strong feature as it provides the hosting of new type of shows that the current USF building cannot accommodate, while operating in the same and vibrate way. This is achieved by focusing on high-quality interior equipment rather than on an shiny and precious exterior skin, that we here conceive in line with the current industrial aspect of the site – built out of wood and steel. A rich aspect of the project is its access. Rather than settling for an expected main access on the upper street, creating conflicts as the building ends up turning its back to Dikkedokken, the historical dock here becomes the main entrance of the venue. This represents the opportunity to create a welcoming entrance to the audience, celebrate the historical site, open-up more views from the neighborhood, and locate all technical spaces and access between USF and the new venue.